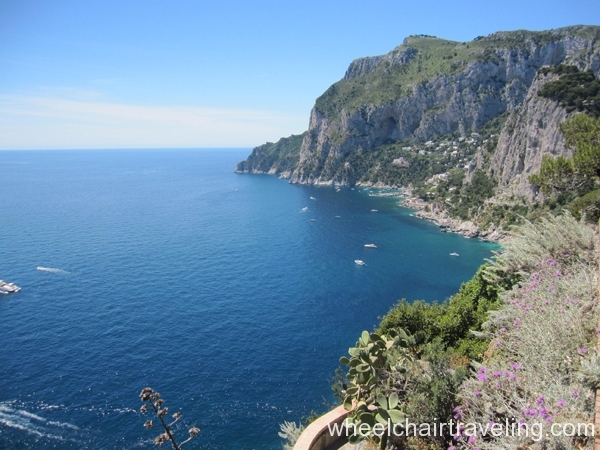 This article is based on a day trip to Capri we took from Naples in May of 2014 and, to a lesser extent, one in 2006. 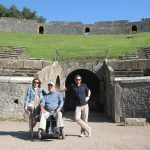 We also went to Rome in 2014 and wrote articles about wheelchair access in Rome, in Naples and in Pompeii; they can be found on the same website as this one. Because one’s capabilities, limitations and equipment affect the access achievable and his point of reference informs his perceptions, we’ll tell you about ourselves. Howard has FSH muscular dystrophy, uses a power wheelchair and cannot stand or walk. Michele is able-bodied. In 2014 Howard used his everyday wheelchair, a Permobil with a seat elevator, reclining back, elevating footrest and tilt-in-space. The Permobil is comfortable and rugged. It weighs around 325 pounds (148 kg) and cannot be lifted, but it can climb a curb or step around 3 inches (7 to 8 cm) high. 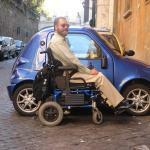 The Permobil is 26 inches (66 cm) wide and, with the footrest in the shortened position, 48 inches (1.22 meters) long. 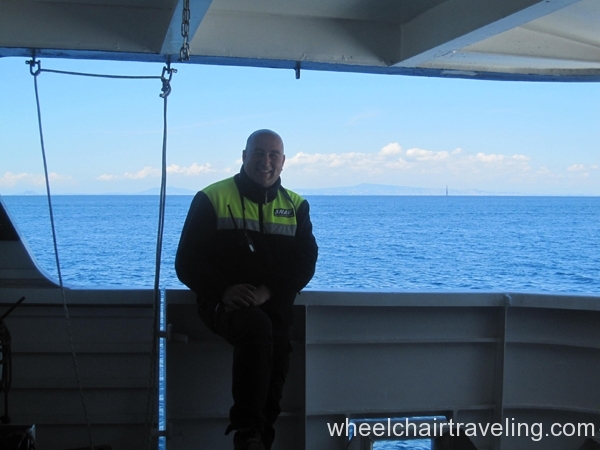 We took the ferry from Molo Beverello (Beverello Pier), the main ferry pier in Naples, located downhill from the Palazzo Reale. (This appears to be the only departure point for Capri from Naples; we were told there are no boats to Capri from Mergellina.) The ferry terminal is an easy 10 to 15 minute stroll from the intersection of Via Toledo and Via Chiaia. Part of the route is an easily accessible, flat, smooth elevated walkway alongside a huge construction site. Note that Molo Beverello is closer to most hotels than Molo Angioino, the much larger pier with ships bound for Sicily, North Africa and elsewhere, but not Capri. There are two main types of ferries – “fast” ferries, which accommodate cars on the lower deck and take one hour each way, and hydrofoils, which take 45 minutes. (There are also a few regular ferries, which take 80 minutes, are very large and have cheap fares.) In planning our 2014 trip we spent too much time inquiring about departure/return times and accessibility, and received complex, contradictory and confusing information. What we learned when we were there is that there are frequent departures and returns, most of the ferries are wheelchair accessible, they can carry a large number of passengers, and none were sold out. (We were there on a weekday.) It’s best just to show up when you want to and buy tickets for the next ferry that the ticket agent says is accessible, rather than trying to find out access information in advance, which would be subject to change anyway. There is a small discount for disabled people, which doesn’t seem to be consistently applied. Several companies operate ferries, so for maximum flexibility, it’s best not to buy a roundtrip ticket; that way you can return on the next accessible ferry that suits your schedule. But when you arrive in Capri, be sure to note the departure times for the last few return trips to Naples. In 2014 we took a “fast” car ferry to Capri. The gangway ramp is somewhat steep, which was easy in Howard’s Permobil, but manual wheelchair users would need assistance. The ramp is wide and has handrails on both sides, so slow walkers should be able to handle it, with assistance if needed. One enters on the lowest deck, the garage level. There are stairs to the passenger deck above, and an elevator that appears from the outside to be large. The crew explained that the elevator was broken and encouraged us to take the next ferry, but we had gotten a late start and didn’t want to wait any longer, so they let us aboard. We remained on the car deck, which could have felt claustrophobic because there are almost no windows, but it’s huge and there were few cars, so it didn’t. The friendly crew members brought us espresso and allowed us into a restricted area near the rear. From there a door led to a small open service deck, which Michele and our friend Chris were allowed to enter. 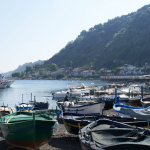 They hung out there from time to time, enjoying the sea breeze, the clear blue sky, the view of Naples as it receded, the hum of the engines, the nautical equipment, and the occasional pleasant water spray from the boat’s wake. There is a high threshold at the bottom of the door, so Howard remained just inside, the crew keeping the door open so he could see as much as possible. The broken elevator, and the crew’s kindness and willingness to improvise, were a blessing. In 2006 we had taken a similar large ferry, which had a diagonal stair lift (not a full elevator as in this ferry) to bring passengers in wheelchairs up the long flight of stairs to the passenger deck. The lift was short – Howard’s footrests protruded over the front edge – and narrow, with only an inch to spare on either side. It was old, creaky, slow and precarious. Because the lift was slow and vehicle exhaust rose into the stairwell, Howard inhaled a lot of exhaust. The windows on the passenger deck didn’t open and there was no open deck, so the passenger deck smelled of exhaust. Our experience in 2014 was much better. Our hunch is that some of the large ferries still have diagonal stair lifts, and others, like the one we were on, true elevators. But since you can’t count on the elevator being broken and the crew being so accommodating, if you have a choice of ferries and want to be on an open deck, take the hydrofoil. 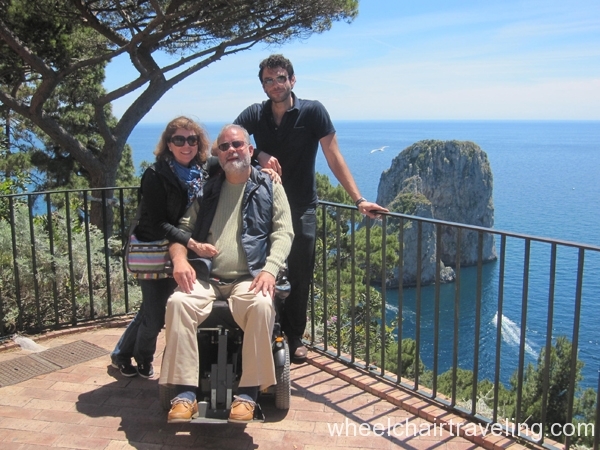 We did this returning from Capri to Naples in 2014 – not by deliberate planning, but because the next departure from Capri when we arrived at the terminal happened to be a hydrofoil, it was accessible, and we were curious. The hydrofoil was much smaller than the regular ferry, but still large enough to accommodate a couple hundred passengers. Along with many other passengers, we remained on the open part of the lower (main) deck. There is a stairway to the upper deck, but there didn’t appear to be an elevator or a lift and, anyway, we preferred to remain in the open, savoring our last views of Capri. 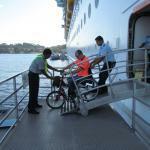 The gangway ramp is quite steep at one end, much steeper than the ramp on the regular ferry. Howard used the Permobil’s tilt feature. Chris and Michele held the back of Howard’s wheelchair for stability as he exited. Manual wheelchair users and slow walkers would need much assistance in both directions, but should be able to navigate the situation. On arriving at Naples we waited until most of the other passengers had exited, in order for the ramp to become nearly level with the dock. We don’t know about bathroom access on the ferries. Capri Ferry Schedule (but see our comment above). The ferry arrives at Marina Grande, the island’s main port. From there we took the funicular up to the town of Capri, the main town. The employees at the bottom and top stations were skilled and enthusiastic; our experiences in 2014 and 2006 were very positive. 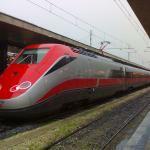 There is a gently sloped ramp with a railing leading to the boarding platform. 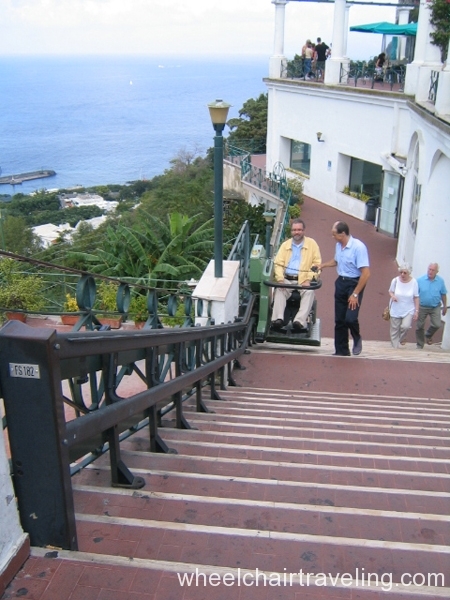 There is a three-inch change in level, and a horizontal gap of a few inches, to enter the funicular at Marina Grande, so employee assistance may be required. Exiting at the town of Capri was a bit easier because the change in level is less. The five minute ride was great fun as the panoramas opened up before us. 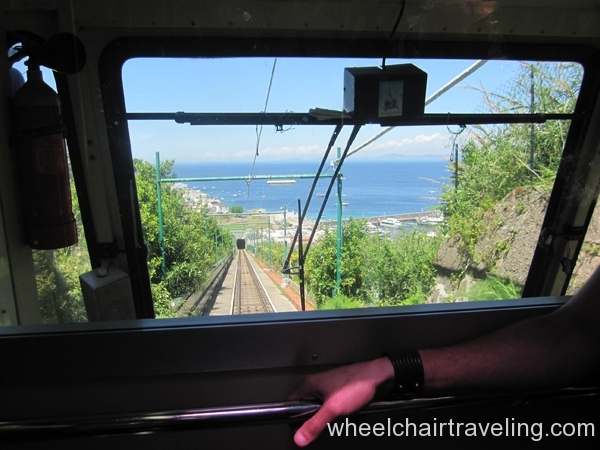 Funicular in Capri – SIPPIC. Phone: 081-837-0420. 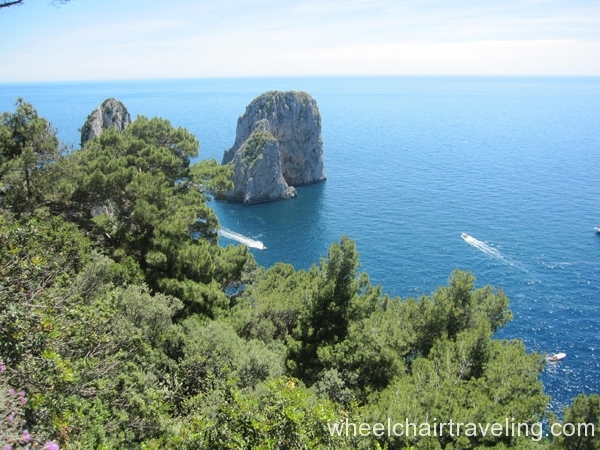 At the top, in Capri, a large elevator with plexiglass walls brings you up to a landing. The elevator appeared to be new in 2006, and was still in excellent condition in 2014. From the landing there is a long set of stairs and a diagonal stair lift up to the Piazzetta, the bustling, charming (though touristy) main piazza. The stated weight capacity is 190 kg (418 pounds), significantly less than the weight of Howard plus his Permobil. In 2014 the employee initially was reluctant to let Howard use it, but there seemed to be no alternative, so he relented. The platform sagged, our friend Chris held it as it climbed, and we heard creaky gear and motor sounds. Howard, Chris and the employee held their breath and crossed their fingers. Only later did we learn that bus access is good and we could have taken one from Marina Grande to Capri and even all the way up to Anacapri. If the funicular employee at Marina Grande had been aware of this, or had thought to mention it, we would have taken the bus and avoided using the stair lift. This experience was a common one in Italy: the actual state of access, the facts on the ground, is much better than the information. 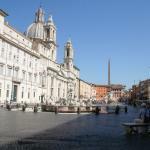 The Piazzetta and most of the streets with restaurants, stores, hotels and gardens are accessible. Some streets are flat and others slope, most moderately and a few quite steeply. 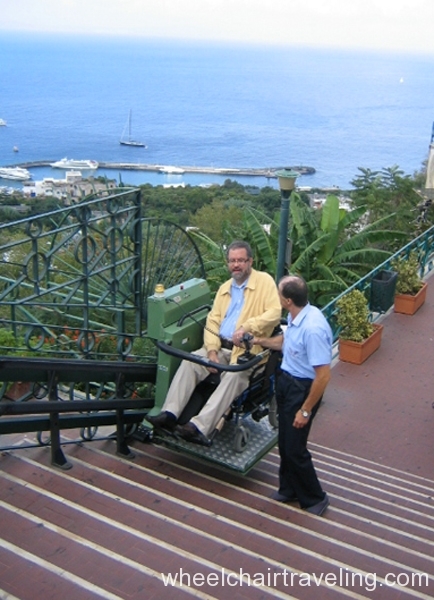 Even the steepest were not difficult in Howard’s electric wheelchair; people in manual wheelchairs would need assistance. 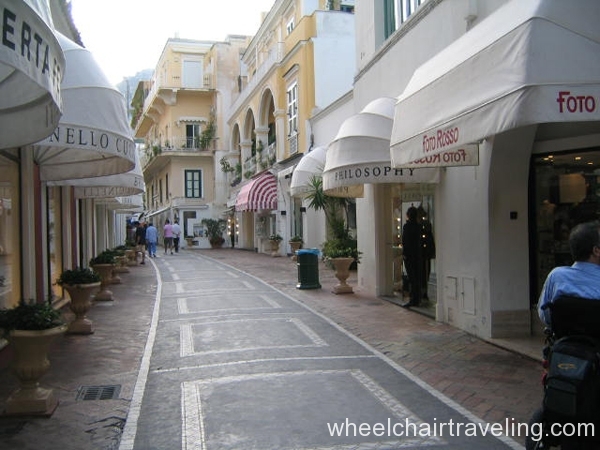 There are few streets with stairs – not because of a conscious effort to provide wheelchair access, but because it’s easy for hotels, stores and restaurants to move people and supplies in motorized carts on sloped streets. Many of the streets are pedestrian only. Beautiful vistas are everywhere you turn, and we felt serene, relaxed, happy and content despite the commercialism. Many hotels have lush gardens and terrace bars with views. One way to see great views is to enter hotels and look at their common areas or have a drink at their terrace bars. The Gardens of Augustus are upstairs and, hence, inaccessible. Howard was able to go down the adjacent street all the way to the topmost part of via Krupp, the winding street leading down to the sea. The remainder of via Krupp was closed for repairs, so we don’t know whether there are stairs or very steep slopes as via Krupp approaches the sea; there probably are. We didn’t have time to go to Villa Jovis (Tiberius’s villa), which is at the other end of the island. There is a large accessible public bathroom adjacent to a parking lot near the main bus stand in town, not far from the Piazzetta. It’s down a steep driveway from the street. Large open-top taxis are waiting near the bus stand, offering scenic rides. The passenger doors are large, so some manual wheelchair users may be able to transfer into them. In 2014 all or most of the buses were accessible. The buses are small but have large, modern, sturdy wheelchair lifts at the rear, which handled Howard’s Permobil easily. 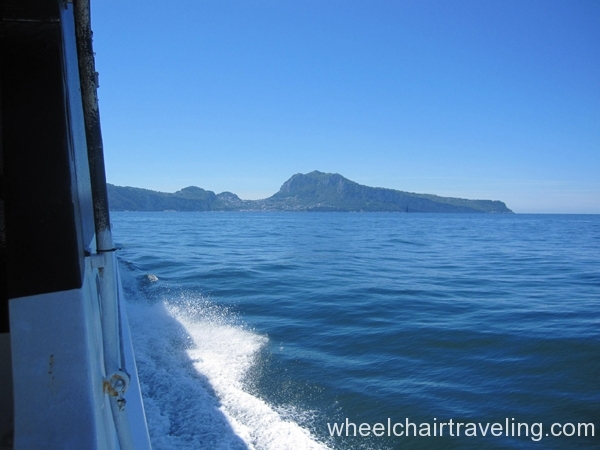 We took the bus from Capri up to the town of Anacapri, which, although it has hotels, art galleries and shops, is a bit less touristy, and where many of the island’s residents live. On our return we took the bus from Anacapri all the way back down to Marina Grande. The drivers and our fellow passengers gladly found space for us on the jam-packed buses. The road is filled with switchbacks, hairpin turns, narrow passages with no shoulder, and at many points there’s no visible railing. The view is breathtaking and exhilarating. Bravo to the drivers, especially the one on the way down, who encountered a bus coming up and navigated within an inch of it without breaking a sweat. Nor did our fellow passengers, at least not the locals. This ride is not for the faint of heart. If you’re going to die in a bus accident, let it be on this bus! We had only a short time to spend in Anacapri. Much of the main street is accessible and relatively flat. Some of the side streets have stairs. 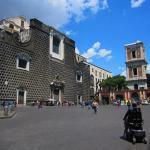 We couldn’t find an accessible way to get to the Church of San Michele. The views, lush plants and natural beauty are magnificent, but the architecture isn’t and the vibe seemed dull compared to Capri town. However, our impression is based on a quick visit. On both trips we only scratched the surface. There’s a lot more to see, much of it accessible. Both towns have many pedestrian zones, making them easy and carefree to explore. 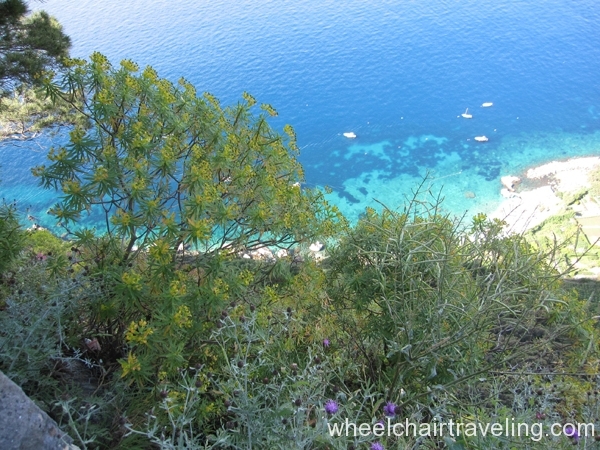 Capri has many restaurants on terraces with spectacular views. Several had been recommended but, when we tried to go there, none was accessible – typically they are up or down a few stairs from the sidewalk. 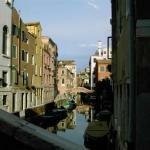 In 2006 we found la Capannina, close to the Piazzetta, and splurged on lunch there. In 2014 we located a few recommended restaurants but none was accessible. We remembered la Capannina, went there again, and were delighted that it was as good as we had remembered. In 2014 we feasted on octopus salad, burrata, scialatelli (long, flat Neapolitan pasta, almost square in cross-section) with tomatoes and small white fish, baked Mediterranean sea bass, linguine with clams, and Neapolitan greens. In 2006 we enjoyed lightly sautéed fresh porcini mushrooms, ravioli caprese, baked swordfish with tomatoes and olives, and prawns with pureed chickpeas. The unusual dessert pastry involved fresh local mozzarella, with a perfect smooth texture and subtle flavors. Everything on both occasions was delectable and fresh. There is a superb wine list highlighting regional and local – very local – wines. Service on both occasions was attentive yet leisurely, warm, gracious and proud. Both times we came for a late lunch without a reservation and were seated immediately; reservations are essential for dinner and prime lunchtime. La Capannina may be hyped, but with good reason. 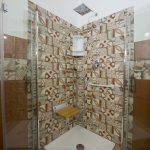 Though expensive, it was a fair value for the quality, service and location. In 2014 we ate in the main (upper) room, which has level access from the sidewalk. In 2006 we sat in the lovely garden terrace (sunny although without a view), which is entered through a narrow side street noticeably lower than the main street. There is a high stair, and the waiters lifted Howard’s lightweight Quickie power wheelchair. This wasn’t possible in 2014 because Howard was in his heavy Permobil. 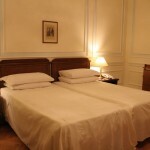 Both rooms are charming, but if you are able to access the lower terrace, we recommend it. 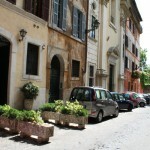 Ristorante La Capannina. Via Le Botteghe, 12 bis and 14. 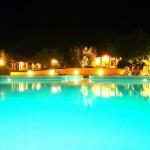 Phone: +39-081-837-0732. 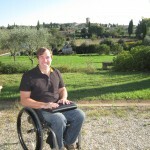 Howard Chabner is a disability rights activist and retired lawyer who has FSH muscular dystrophy (FSHD) and uses a power wheelchair. Michele DeSha is a ceramic artist and painter. 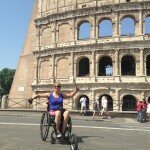 They have written numerous articles about wheelchair accessible travel in Italy, France, Spain and Israel. For several years Howard has been working with Context Travel to help make their walking tours more disability accessible. Michele and Howard live in San Francisco. Howard is a docent at San Francisco's beautiful Beaux-Arts City Hall. 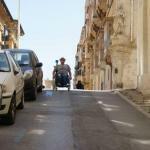 Accessible Italy? Yes we can!